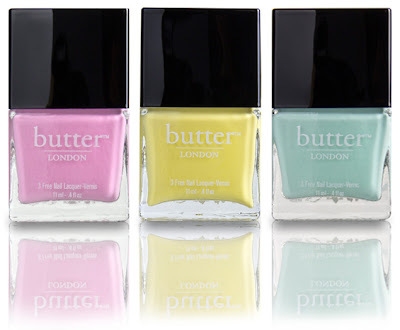 Even though Spring is taking it's time to arrive here on the East Coast, you can surround yourself with pretty, spring pastel shades with the new butterLONDON Candy Coated Trio for Gwyneth Paltrow's website GOOP as part of her exclusive collaborations. buttonLONDON was inspired by the charming colors and silhouettes of the 50’s with this collection. Immediately gravitated towards "Jasper" which is a creamy, perfect yellow. The other two shades are "Fruit Machine" pink and "Fiver" green. All three shades are very creamy and smooth and work well with either one coat or two. The polish didn't streak and the brush is always very easy to use if you're doing an at home manicure. The finish is shiny and the wear with a top coat is at least a week. *This product was provided courtesy of butterLondon for Goop PR for reviewing purposes.